A majestic statue of Queen Boudica, erected in 1902, stands guard along the River Thames in London across from Big Ben and Westminster Bridge. "It is not as a noble, but as one of the people that I am avenging lost freedom! cried Boudicca"
Celtic lore speaks of the great Queen Boudica who led her people in a widespread revolt in 61 A.D. against Roman invaders who sought to eliminate the native cultures of Britannia and destroy all who refused to succumb to their might. Her husband, King Prasutagus of the Iceni tribe, had preserved a tenuous relationship with the Roman occupiers who provided him funds to maintain peace and order at this remote edge of their empire. Upon his death, Boudica became the sole ruler of the Iceni. However, Roman law and culture forbade women any level of authority and sought her resignation. Additionally, the funds provided to her husband were declared loans which the Roman government now sought repayment. Such an unspeakable personal assault against her family spurred Boudica to lead not only the Iceni people, but also neighboring tribes to take arms against the Romans who had invaded their lands. In a series of swift and brutal attacks, Boudica led her warriors shoulder-to-shoulder in battle on a scorched earth offensive against the tyranny and brutality which had befallen their realm. 100,000 strong, she and her militia burned and destroyed at least three Romans settlements in Britannia, including Londinium (ancient London). 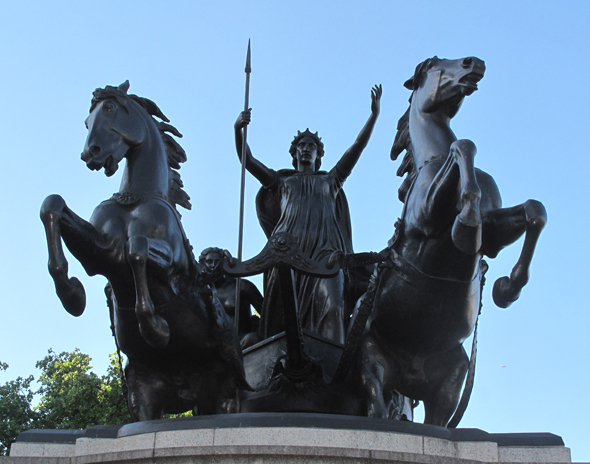 Boudica (which translates to "Victory") remains a symbol of strength and resistance in the face of great tribulation for the Celtic and British people. Even Queen Victoria was portrayed as her namesake. Later in World War II, Winston Churchill would often speak of Boudica during rallying speeches to bombarded Londoners as they looked to her as a source of resilience. Mead likely served as a favored drink that powered Boudica and her rebels against tyranny. Honey Grail seeks to reintroduce mead to the American public by adapting it to modern palettes. Our meads are neither excessively sweet nor overly priced.